Acticoat 7 Antimicrobial Barrier Dressing is a dressing utilizing advanced silver technology to help create an optimal wound environment. 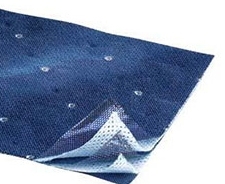 It features a rayon/polyester core that helps manage moisture level and control silver release, a silver-coated high-density polyethylene mesh that facilitates the passage of silver through the dressing, and the nanocrystalline coating of pure silver delivers antimicrobial barrier activity within 30 minutes - faster than other forms of silver. -Delivers fast-acting, long-lasting antimicrobial barrier control. -Effective barrier which may assist in preventing contamination of the wound. -ACTICOAT 7 is versatile. The dressings can be cut to the desired shape and size to wrap around all body parts. -The sustained release of silver also means fewer dressing changes, resulting in less exposure of the wound bed to the environment. This reduces the risk of infection, which lowers hospital costs. -ACTICOAT 7 is cost-effective because it can be left on wounds for up to 7 days. Follow standard protocol to cleanse wound; do not use oil-based cleansing agents. 1. Remove the ACTICOAT 7 dressing from the package and cut to size. 2. Apply the dry ACTICOAT 7 dressing to the wound, either side down, as the exudate will be sufficient to activate the dressing. 3. Cover the ACTICOAT 7 dressing with an absorbent secondary dressing. 4. Complete the dressing with appropriate gauze wrappings if necessary. 1. Remove the ACTICOAT dressing from package and cut to shape. 2. Moisten the dressing with sterile water (do not use saline). 3. Allow the dressing to drain on an absorbent surface in a sterile field for at least 2 minutes. 4. Apply the ACTICOAT 7 dressing to the wound surface, either side down. 5. Cover the dressing with a moist absorbent secondary dressing which may be prepared by saturating gauze with sterile water and wringing out the excess water. 6. Complete the dressing with appropriate gauze wrappings if necessary. If the dressing dries and adheres to the wound, moisten or soak the dressing prior to removal. Avoid forceful removal of the dressing and disruption of the healing wound. -ACTICOAT 7 is not compatible with oil-based products, such as petrolatum. -Avoid contact with electrodes or conductive gels during electronic measurements, e.g. EEG and ECG. -Avoid exposure to temperatures above 50 degrees C. Protect from light. -Do not use if product color is not uniform. -Do not use contents if pack is opened or damaged.